We already know about the dangers of texting and driving. And we're also aware of studies suggesting a link between text messaging and poor sleep. Now, there's another health effect being studied in connection with texting: the physical toll it can take on your back. New York spinal surgeon Dr. Kenneth Hansraj concluded in a study last month that "the weight seen by the spine dramatically increases when flexing the head forward at varying degrees." When the head is bent at 15 degrees, for example, the force on the neck is measured at 27 pounds. When it bends as far as 60 degrees, it exerts a force of 60 pounds, his research said. The study included a visual model explaining Hansraj's conclusions. Hansraj said that poor posture happens when the head and the shoulders tilt forward — an inevitable position when a person looks down at their phone. This, in turn, can affect the spine's curve. He went on to say that losing the spine's natural curve can lead to "wear, tear, degeneration, and possibly surgeries." 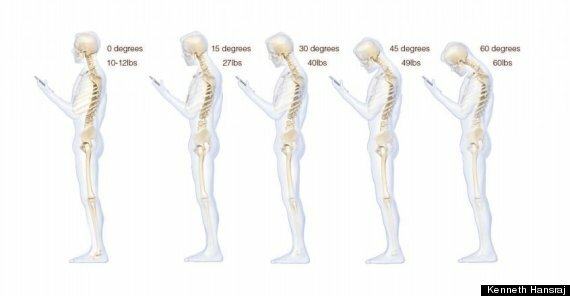 People spend two to four hours on average every day arching their heads to look at their phones, which can equate to 700 to 1,400 hours of "excess stresses seen about the cervical spine." He said high school students can spend an additional 5,000 hours exhibiting such posture. Ultimately, Hansraj recommended that people try to avoid hunching over, and look at their phones with a "neutral spine." This research corresponds with other doctors' findings on the topic. In 2011, Kingston, Ont., chiropractor Dr. Peter Pain blamed an uptick in back and neck pain on smartphones, QMI Agency reported. "It will be scary in five or 10 years from now, seeing the hand, neck and shoulder issues from all the chronic texting people were doing as teenagers," he said. Canadians sent, on average, nearly 2,500 SMS messages per second in 2011, up almost 40 per cent from the previous year, according to the Canadian Wireless Telecommunications Association.